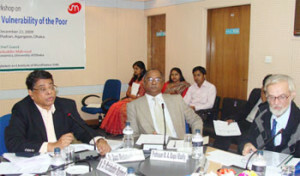 InM in collaboration with United Nations Development Program (UNDP) Bangladesh, organised a seminar on “Micro-insurance and Vulnerability of the Poor” on December 22, 2009 at PKSF Bhaban, Agargaon, Dhaka. 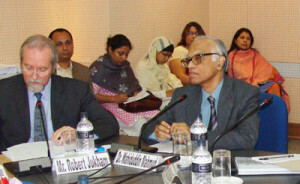 Dr. Wahiduddin Mahmud, professor of Economics, University of Dhaka and Chairman, InM and Mr. Robert Juhkam, Deputy Country Director (Programme), UNDP were both present at the seminar as Chief Guest and Special Guest respectively. In the inaugural session Mr. Juhkam pointed out the need of micro-insurance for the poor. He emphasised on the need of collaboration between donors, government and non-governmental organisations in reducing poverty by 2015. Two papers were presented in the business session: Dr. S. A. Hamid presented a paper on “Risk and Vulnerability of the Poor in Rural Bangladesh” while Professor M. A. Baqui Khalily presented “Inventory Analysis of Micro Insurance Products in Bangladesh”. The papers put forth some interesting revelations about the intensity of health shocks experienced by the rural people and also stated the importance of health insurance products in mitigating their vulnerability to such shocks. A lively open discussion session followed the business session where participants voiced their important opinions on the topic. It was suggested that to get a broader and complete picture of the shock situation at the national level, similar surveys should also be conducted at the urban areas. InM and UNDP also stressed the need for conducting surveys to understand the nature of shock changing over time due to climate change.